Happy Monday! 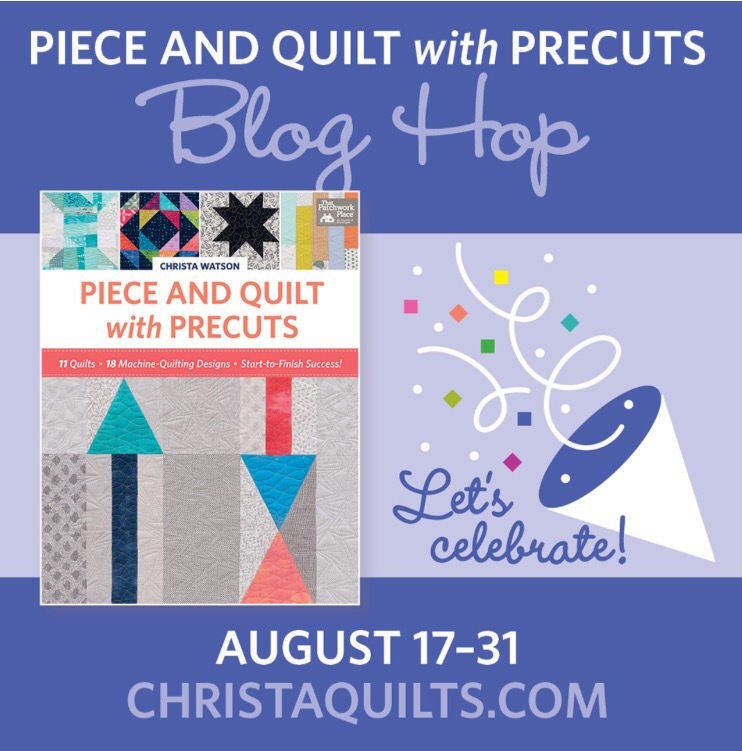 Today I’m down in Oregon watching the eclipse, but that certainly isn’t stopping me from enjoying the Blog Hop celebrations for Christa Watson’s new book, Piece and Quilt With Precuts! Today I get to share with you the project I made using the third pattern in the book, Frequency. Also, I’m hosting a giveaway for an e-copy of the book! Details below. But before all that, I’ve gotta talk a bit about the awesomeness of this book! Christa has done a great job making this a resource for both beginning and advanced quilters. 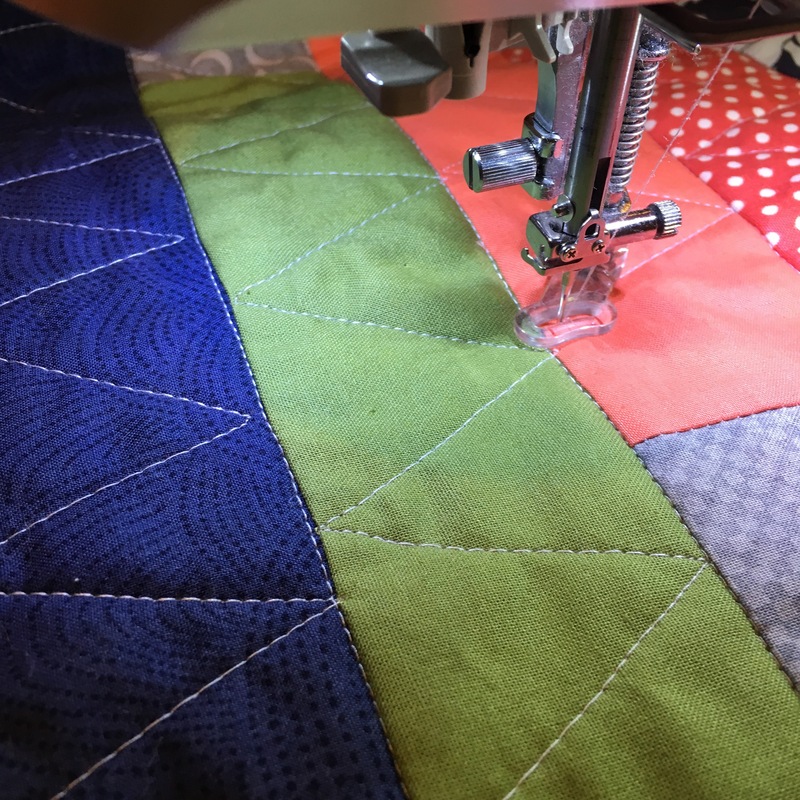 Her opening chapters give a ton of information not just about basic quilting, but her favorite materials and lots of great tips. With each pattern, there is detailed instructions for a possible quilting motif. 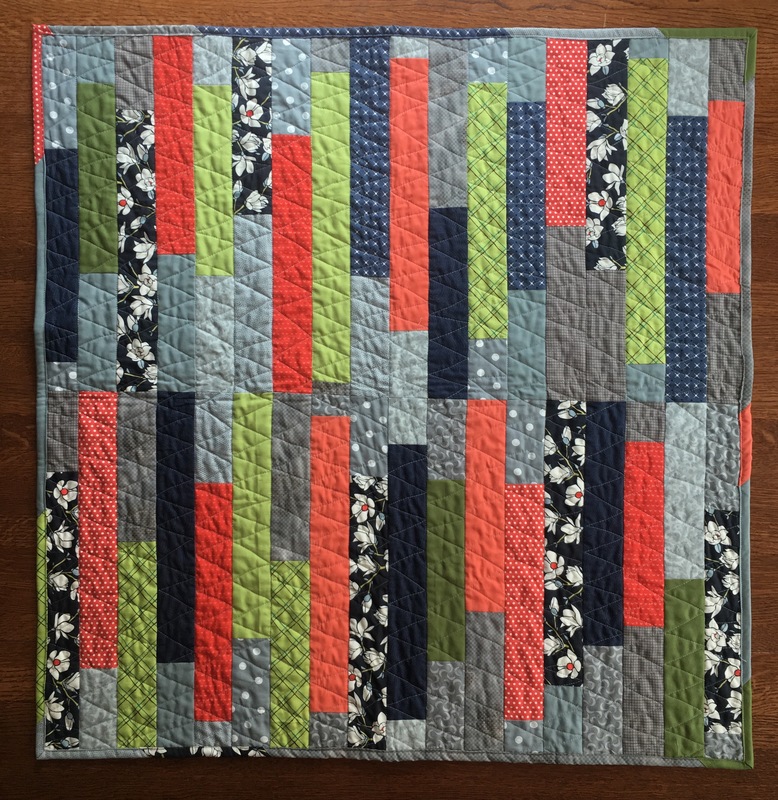 She keeps the patterns simple yet beautiful, and gives tons of options for mixing and matching the patterns and quilting motifs. It’s like a choose-your-own-adventure quilting book! My first task was fabric selection. I wanted something fall-themed, but not in-your-face fall themed! I started with the navy floral, Magnolia Nightfall from Amy Simbaldi’s Charleston collection. It had exactly the sophisticated fall palette that I was looking for. From there, I pulled blenders to coordinate. Because I was pulling from my stash, cutting strips was the most tedious part of the process. I like Christa’s plan of using precuts much better! But once they were cut- oh boy- were they gorgeous of what?! Chain piecing the strips was really fun because I got to play with combinations of background and focal fabrics and it all went super quickly. I love patterns where the process is so enjoyable! 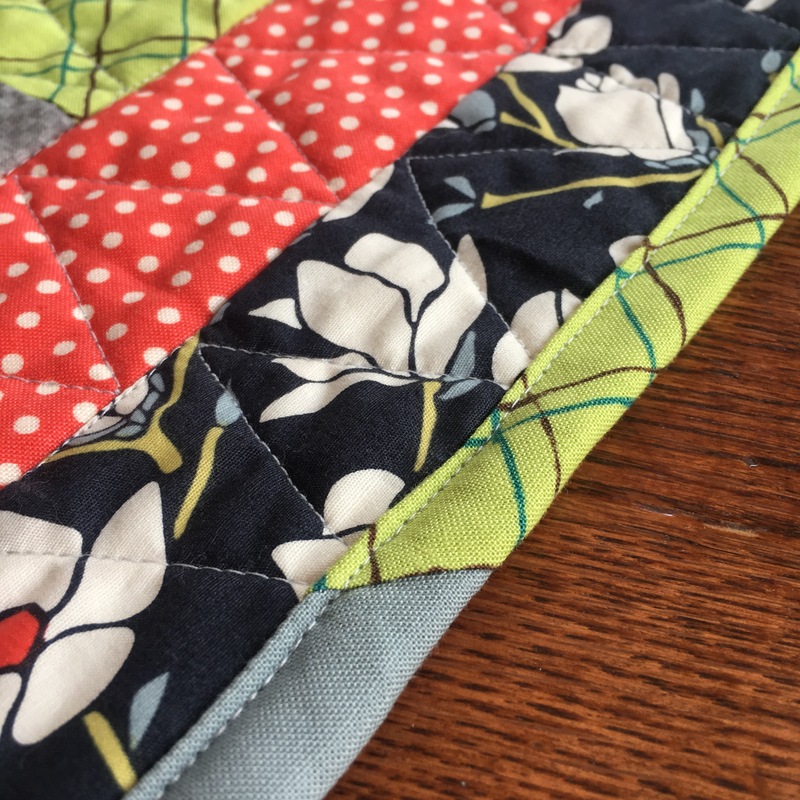 When it came to quilting, I wanted to take advantage of the mix-and-match fun in this book. But of all the quilting motifs included, I really felt like the zig zag that Christa suggested for this pattern was the best for my project. I decided to make four blocks from this pattern to make a baby quilt instead of a full-sized one. It will be donated to a local charity through my guild. I added a scrappy binding by machine for durability and to save time. I love hand binding, but I think that in the future, my quilts for kids will probably be machine-bound. I love how it’s such a fun and quick finish, but has a lot of visual impact. It’s a great pattern to really draw attention to a beautiful fabric collection. Now that you’ve seen my project, head on over to Masterpiece Quilting and Stitch This! to see what they made out of the same pattern. This book is a great resource to have. I will definitely be using it in the future to make more pretty things. 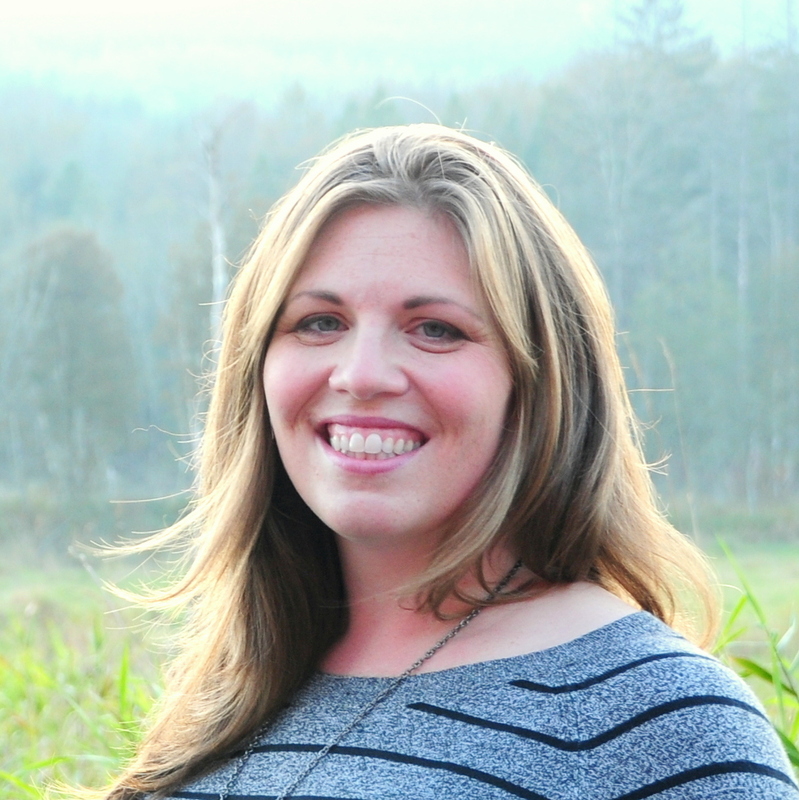 And if you don’t want to wait to see if you win, or want to score a SIGNED copy, visit Christa’s website to purchase a signed copy of the book directly from her! 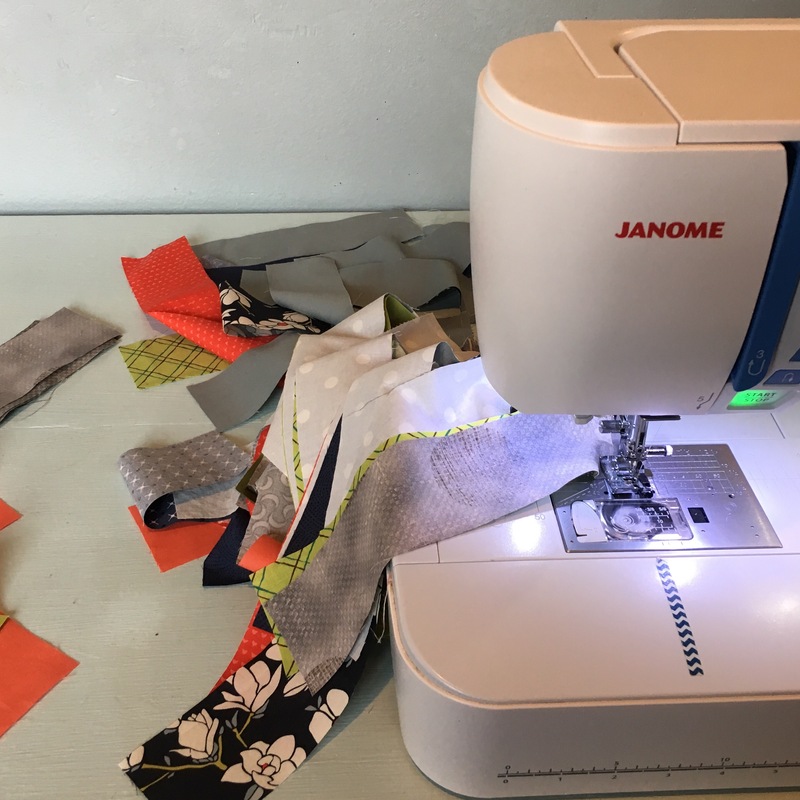 ← Piece and Quilt With Precuts Blog Hop Begins! I saw a preview of quilts on Martingale, so I don’t know the names of the quilts. But I am a sucker for stars and love the star quilt I saw! Frequency would be a great quilt for my leftover Christmas fabrics! I love your version of it! Thamks for the great giveaway! Hard to pick a favorite but when I love the baby quilt you made. Love the color choices. I think this is the first pattern I will use. I love the idea of making baby quilts with it. I usually never do my own quilting but hire someone to long-arm quilt it. Now that I have seen it in action, I’m ready to give it a try. It doesn’t have to be as perfect as I think!!! My pick from this book is “Kites”! I already bought the printed book but would love a copy of the eBook so it’s on my iPad for easy reference when at the quilt shop!! I always have a hard time choosing my favorite but so far I like the Gridwork pattern but I sure do like your color and fabric choices for the Frequency pattern. Right now the quilt from the book that I’ve got my eye on is Gridwork. Love your quilt as well! 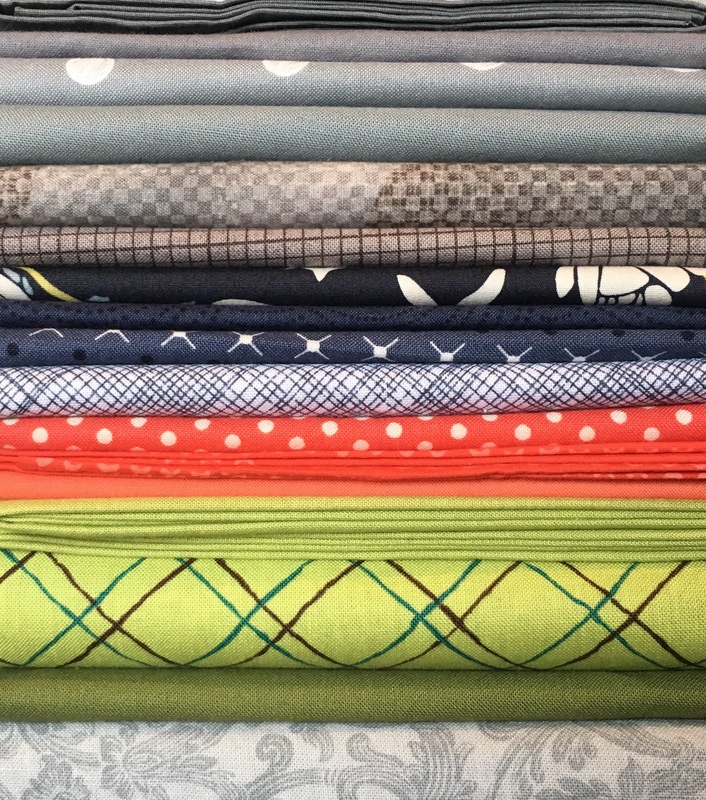 Your fabric choices are fabulous and your quilting is very cool. I’m a fan of most starry quilts so “Starstruck” is on my list. But I love the colour contrast of Christa’s “S.W.A.K.” (despite the multitude of HSTs!). I would like to try this one, “Frequency”. I have some jelly rolls to use and the quilting looks like it’s easy enough that I could handle it. Thanks for the inspiration! I’d like to make Squiggles and Gridwork. I’d like to do Spools for a gift. Lovely quilt! I would love to make the Squiggles! Love stars fo Star Struck would be my first of many from this book. I’d like to try the one with arrows. I would love to make Frequency. I like how it just takes two jelly rolls! I like the star quilt. I like to be Starstruck. I think Gridwork would be my first project from the book, it has such a modern feel and would be perfect for a charity quilt. I like most of the quilts in the book because they lend themselves to using scraps (for those of us with no precuts). I would start with the quilt on page 2 and go from there. Love the colors you chose. Beautiful!! I like the dot and dash quilt..not sure of the name. I think it is also made with a jelly roll. Love this quilt! Beautiful fabrics! Your quilting suggestion in ingeniously simple. Love it. There are some great projects in this book and several that I would like to try. Star Struck comes to mind. Your piece is so rich in color. i love it. Hmmmm. I think that SWAK table runner is calling to me. I like the quilting pattern.